Corian® Quartz joins the Corian® Design Portfolio of Materials . The new Corian® Design brand showcases its evolving and expanding collection of colors, its portfolio of materials, shapes, and solutions, as well as its technological developments aimed at improving its performance and adapting it to the evolving needs of modern society. Organic and geological in inspiration, guided by design and style directions, the Corian® Quartz introductions for 2018 reflect the natural world at its best. Encompassing modern technology, Corian® Quartz offers aesthetics with visual depth, embraces classic looks, and launches an exciting, new, soft leather texture. 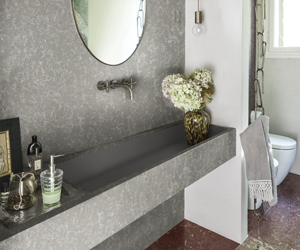 Corian® Quartz can be whatever your design imagination commands it to be. Nonporous and stain-resistant, Corian® Quartz is easy-to-clean, making it an ideal surface for home kitchens and baths as well as for healthcare, hospitality, restaurant, and retail environments. Corian® Quartz was created for a lifetime of easy care. Just follow our simple guidelines to help you keep your Corian® Quartz surfaces looking fresh.